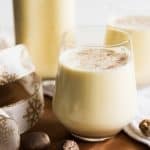 Light, creamy, and spiced with freshly grated nutmeg, this non-alcoholic Homemade Eggnog is so, SO much better than the store-bought variety that shows up in cartons each year around November or December. It is both a beloved and beleaguered holiday beverage with a fascinating history. Whisk together the egg yolks and sugar in a mixing bowl until light in color and creamy. In a saucepan, combine the milk, cream, nutmeg and salt and heat over medium heat until barely at a simmer with bubbles forming around the edges, but do not bring to a boil. Slowly whisk 1/2 cup of the hot liquid into the eggs and sugar to temper the eggs. Repeat a few more times until about 1/3 of the hot liquid has been mixed into the eggs. Add the tempered egg yolk liquid back into the pan with the remaining milk and cream and heat until it reaches 160 degrees or just starts to coat the back of a wooden spoon. Remove from heat and stir in the vanilla and rum extract. Transfer to a bowl and cover tightly with plastic wrap, then chill completely in the fridge until ready to serve. Best served the next day after the eggnog has had time to age slightly.